• (U//FOUO) Human behavior does not occur “in a bubble;” secondary and tertiary motivations can co-exist for the use of improvised explosive devices (IEDs) in Afghanistan. 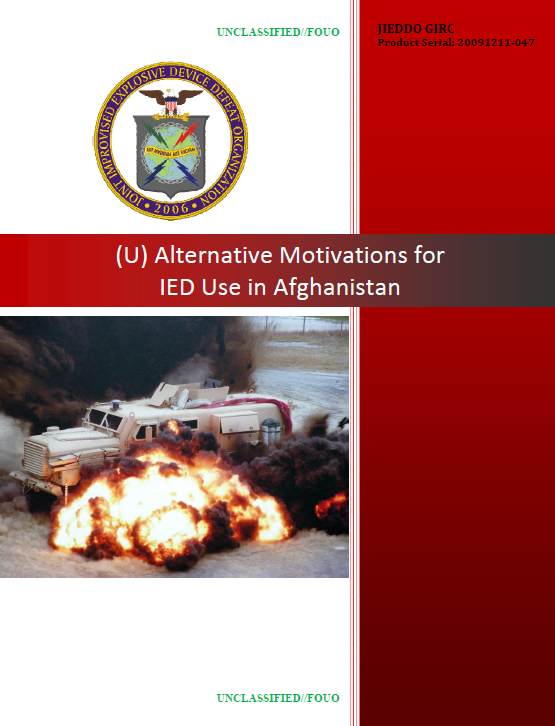 • (U//FOUO) Possible alternative Motivating Operations (MOs) for IED use in Afghanistan include hunger, quality of life, economic development, and opium production. • (U//FOUO) If the food security prediction for Afghanistan is correct, the likelihood of IED attacks directed at supply vehicles is likely to increase, especially throughout the mid-section of the country, as well as in the northern province of Badakhshan. • (U//FOUO) The perpetrators of approximately 58 percent of the IED attacks in Afghanistan are unknown, according to the Worldwide Incident Tracking System (WITS) database. • (U//FOUO) Gross inconsistencies exist in the available open source accountings of IED incidents in Afghanistan. The WITS data are a low estimate of actual figures. (U//FOUO) IED use remains the single most deadly threat in Afghanistan. As the number of U.S. and the International Security Assistance Force – Afghanistan (ISAF-Afghanistan) ground forces continues to grow to meet the surging threat, the probability of troops coming into contact with IEDs will be greater than ever. In order to influence the deployment of IEDs, it is necessary to understand the motivations driving that behavior. The obvious motivation for placing an IED is to inflict harm upon others. However, human behavior does not occur “in a bubble.” Secondary and tertiary motivations can co-exist for the use of IEDs, as well as alternative motivations. The purpose of this paper is to provide an analysis of potential ancillary motivations for IED use in Afghanistan, to the extent possible based on available open source data. The circumstances linked to hunger, quality of life, economic development, and opium production in Afghanistan create conditions that serve as potential MOs for IED use. (U//FOUO) The level of detail possible for assessments of behavioral motivations is contingent upon the quality of the available data related to the IED strikes. Inconsistencies exist in the available open source accountings of IED incidents in Afghanistan. The WITS data serves as an appropriate choice from which to base an open source analysis, due to its transparent methodology and broad use in the Intelligence Community (IC). However, WITS provides a low estimate of actual figures when compared to some of the other tallies of IED incidents. Also, the perpetrators are unknown in almost 58 percent of Afghanistan’s IED attacks listed in WITS. Pinpointing the location and perpetrators of IED strikes in Afghanistan will provide for clearer analysis and understanding of the alternative motivations behind IED use. (U//FOUO) Afghanistan is the source of 90 percent of the opium on the global market. The United Nations Office on Drugs and Crime (UNODC) reports that opium cultivation in Afghanistan for 2008 covered over 1500 square kilometers, or roughly half the area of Maryland. This adds up to significant portion of nation’s total agricultural acreage, as Afghanistan as a whole is smaller than Texas. The UNODC reports the highest concentration of poppy farming is in the southern provinces, with more than 60 square kilometers being used for opium cultivation in each of the provinces of Farah, Nimroz, Helmand, Uruzgan, and Kandahar. To put this in perspective, 60 square kilometers is approximately the size of Manhattan. Afghanistan’s poppy harvest resulted in the production of nearly 17 million pounds (7,700 metric tons) of opium in 2008. Helmand province alone, which is slightly smaller than the state of West Virginia, produces more opium than any single nation in the world. (U) Opium cultivation in Afghanistan circa 2008, according to the UNODC. (U//FOUO) U.S. commanders describe Afghanistan’s IEDs, in general, as being more primitive than those found in Iraq. Previous OSINT analysis shows an overlap in the chemistry of the opium refinement process and the development of homemade explosives (HME) in Afghanistan. A chemist with the ability to refine opium would have sufficient skills to develop HME. Insurgents, narco-trafficers, or even farmers defending their livelihood could then use IEDs built from locally-produced HME.